Innovation is built from inspiration, belief or vision. 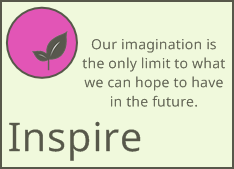 Cotyledon can help you explore ideas and frame them to inspire others, to make a difference or to start something new. Some ‘Dragon’s Den’ ideas have not inspired investment yet have achieved in the market. A brilliant idea can get lost in translation. People sometimes don’t 'get it', or you may be offering something so new and innovative, it could sound risky to the people you are trying to influence. Cotyledon can help you to explore your ideas. We can research to find appropriate models or supporting evidence. We can help you with design aspects or help you reach the right audience and market.